My life would be complete with one of these. Must....have....NOW. French press coffee is always the way to go! It may take a little more time but trust that the commitment is worth it! My parents would love this product. I need to find. There is just nothing like coffee made in a French Press! That being said, Starbucks has taken this one step further and insulated theirs. This is such a huge bonus for someone such as myself who drinks more than one cup. Generally, I would need to either go through the entire process to make another cup, or make more than one at a time and them microwave my second cup. With Starbucks French Press, problem solved! I like the Starbucks French Press because I can add extra coffee, make it really strong, and store it in the refrigerator to use all week, just adding hot water! practically instant coffee first thing in the morning. 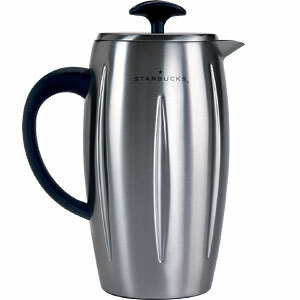 I love the Starbucks french press, especially this model because it's insulated. Your coffee will stay hot for 2 hours after its made. This is super easy to use- anyone can make a good cup of coffee. The coffee grounds stay at the bottom and not in your cup, which sometimes can be an issue with other french presses I've tried!